Two years after a spell teaching at a language institute in Seoul, Mori, a Japanese man, returns to Korea in an attempt to reconnect with Kwon, the woman he loved but had to leave behind. He leaves letters for her explaining his wish for them to meet as well as detailing the minutiae that fills up his Seoul summer days as he waits for her answer. During his sojourn, he hangs out in Bukcheon, a relaxed neighborhood (and Hong's stomping ground) in Korea's capital, staying in a guesthouse, frequenting a local café, making small talk and, of course, getting drunk with the locals. As with many of Hong's films, Hill of Freedom takes a non-linear approach, which is accounted for when Kwon accidently drops and scatters Mori's letters, forcing her to read them out of sequence. The gimmick appears to be little more than that, an excuse to play around with a very simple storyline with little at stake. Then again, Hong's films are rarely about plot so much as they are about individual scenes, the more awkward the better, through which the director pokes holes in the personas we each construct. Much like In Another Country (2012), Hill of Freedom plays out almost entirely in English but the basic language level employed by the film's characters, which often doesn't make it beyond small talk, is a stretch even by his standards, and is sure to rub anyone who has yet to warm to his works the wrong way. On the other hand, the simplistic dialogue plays right into his penchant for repetition, forcing characters with limited ability to communicate with one another to go through the motions again and again. Seeing how different people act in almost the same situation both hints at their personal quirks as well as offer a reflection on society, or how we are expected to behave as members of one, as a whole. As the affable and slightly awkward Mori, Kase Ryu speaks in limited English throughout, surprising those around with his polite but frank observations and confessions. It's a breezy but confident turn from the Japanese star, who outshines most of the local cast, including Moon So-ri and Kim Eui-sung, who seem a little less at ease conversing in a foreign language. Veteran actress Youn Yeo-jeong, playing the guesthouse owner, fares a little better with a typically natural performance. What the cast lacks this time around is a standout performance such as Yu Jun-sang's uproarious lifeguard in In Another Country, whose flirtatious exchanges with Isabelle Huppert in broken English were worth the price of admission alone. Though Hong has excelled in recent years with seemingly lightweight fare such as The Day He Arrives (2011) and Our Sunhi, his latest seems a little too content to coast by, lacking the compelling characters of those works. 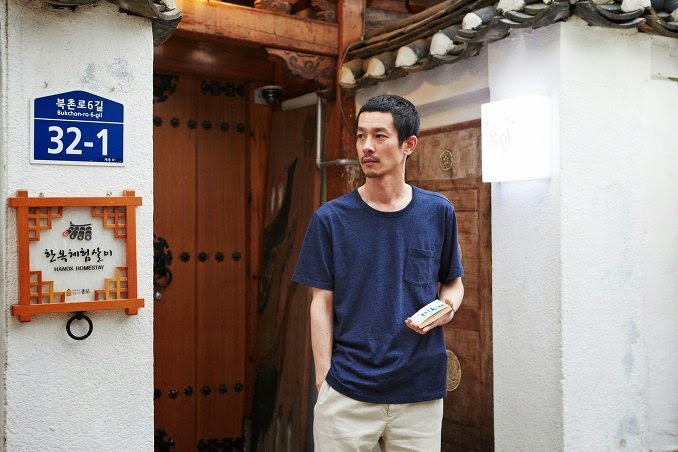 At barely over an hour, Hill of Freedom is an easy and pleasant watch but Hong Sangsoo fans may feel a little short-changed while it will likely prove perplexing for the uninitiated.